The Sinhala and Tamil New Year (Aluth Avurudu in Sinhala) is a very important occasion for both Sinhala Buddhists and the Tamil Hindus of Sri Lanka. The uniqueness of this occasion is the celebration of the beginning of the New Year as well as the ending of the old year at the auspicious times stated by astrologers. There is also a time period in between, which is called the Nonagathe (neutral period). During this time, people stop work and engage in religious activities. In many village temples, the chiming of the temple bell is accompanied with the beating of drums to make the people aware of the exact auspicious time to perform each ritual. Rituals of Aluth Avurudda begin with a bath on the last day of the old year and viewing the moon on the same night. People apply Nanu (a herbal mixture), on their head and body before bathing. This herbal, according to belief, has a purifying effect on the body and the soul. The ending of the old year and the beginning of the new year take place several hours apart from one another. During this time, according to tradition, the Sri Lankans are encouraged to refrain from routine actions, and engage solely in religious activities. During this transition time, people stop all their day-to-day activities, and visit the temple to accrue merit and get their blessings from the priests in the temple. The New Year is celebrated with boiling milk in a new clay pot symbolizing prosperity, as the milk spills over from all sides of the pot. After that milk rice is prepared. 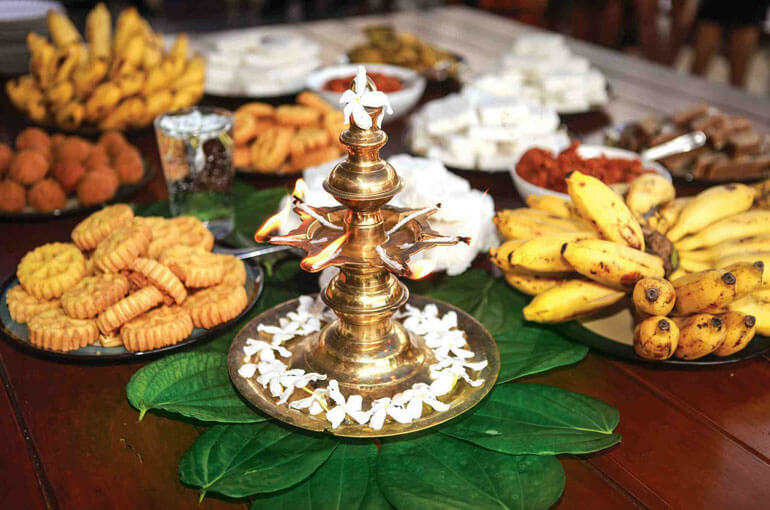 Number of traditional Sinhala sweet meats such as ‘kokis‘, ‘aasmee‘, ‘kewum‘, ‘aluwa‘ and ‘weli thalapa‘ to serve the visitors, to gift the neighbors and to take when they visit others were prepared in advance. Exactly at the auspicious time, the people begin their work. The nature of the work is determined by their age. Children begin their school work. The older people begin their work according to their profession in a symbolic manner. For example, a farmer might go to the paddy field to do a planting activity. A musician would play his instrument and a teacher would start preparations for classroom work. Then there is the time for greeting elders with a sheaf of betel leaves. The elders give their blessings for the young ones for the coming year. Exchanging money in a symbolic manner is another ritual. Many people prefer to exchange money with a person who is successful in earning. Finally, it is time for the family meal at the table. This ritual marks the unity and togetherness of the family. All sit together to enjoy the milk rice prepared at the auspicious time. The table is laid with sweet meats and milk rice. After the basic rituals are over, people begin to visit immediate relatives living close by and they also exchange plates full of sweet meats with friends and neighbors. It is customary to take betel leaves to worship the elders. During New Year time, people travel to faraway places to visit close relatives and this lasts sometimes even a week after the New Year began. Applying oil on heads is another ritual that is not missed by Sri Lankans. The oldest family member is the one who anoints the herbal oil on the heads of the others. The anointment is done at village temples as well. The villages are gathered to have anointed oil on their heads by the head priest of the temple. In most parts of Sri Lanka, specially in villages, people still wait until the auspicious time to leave for jobs after the new year. In urban areas, people don’t follow a specific time to leave for the jobs. Just after New Year holiday’s most working people begin their work. If you are in Sri Lanka during the month of April, you won’t be able to escape the festivities. 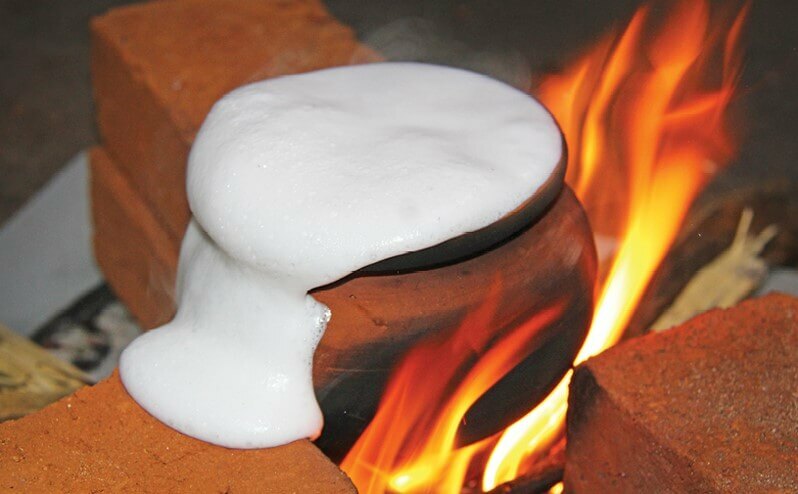 Most hotels and resorts in Sri Lanka will definitely celebrate the Sinhala & Tamil New Year to the fullest.